Terriers suffered a heart-breaking 2-1 overtime loss to #13 Northeastern in the Beanpot semifinal at TD Garden Monday night. Goalie Jake Oettinger put on a heroic performance in goal, stopping 47 Husky shots, but the final one—on Tyler Madden’s breakaway 51 seconds into the extra session went off the junior netminder’s arm and skate and into the net. BU’s only goal came off the stick of freshman Joel Farabee. Oettinger also was victimized on Northeastern’s first shot. As Cam Crotty moved the puck from behind the BU net, NU’s Patrick Schule hooked him, turning his body and causing a turnover—but no penalty call. Liam Pecararo grabbed the loose puck and fed Schule below the right circle for an unmarked shot past Oettinger. BU knotted the score in the final minute of the period. After Shane Bowers kept the puck alive in the offensive zone, Crotty fired a shot from the point that went wide to the left of the net. It caromed off the end boards and was corralled by Farabee behind the goalie. He banked a shot off Cayden Primeau into the net for his 10th goal of the season. Northeastern had a slight edge in shots in the scoreless second period, but the best scoring opportunities belonged to Farabee. Late in the period, he had two clean breakaways but was stoned by Primeau—once on the forehand, once on the backhand. The final period saw an offensive barrage by Northeastern, which had 15 of the first 16 shots and would pour 24 shots—six on power plays—on Oettinger, who turned them all away. In overtime, with BU on a line change, Ty Amonte was unable to get the puck deep int the NU zone. Jeremy Davies grabbed the loose puck and his headman pass hit Madden in stride, behind the defense. He beat Oettinger stick side sending the Huskies to the tournament final against BC. 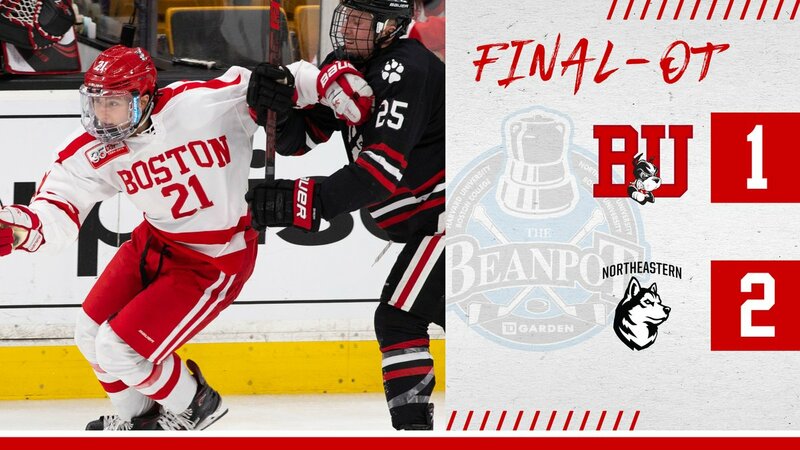 BU will face Harvard next Monday in the consolation game. The loss was BU’s third to a ranked team in recent weeks. 2021 recruit Jeremy Wilmer scored four goals and added two assists in the North Jersey Avalanche’s two-game sweep of Elite Hockey Premier. He had a hat trick in the first game, a 6-1 win. In the second game, a 4-3 win, Wilmer assisted on the game-winner scored by 2020 recruit Devin Kaplan. Wilmer has 53 points (24G,29A) in 20 Atlantic Youth Hockey League games. He also has 52 points (19G,33A) in Tier1 Elite League games, averaging nearly 2.5 points a game. Kaplan has 33 points in AYHL games and 28 in Tier1 contests. #8 Terriers face #3 Northeastern in Women’s Beanpot action at Conte Forum. The game airs on NESN+ and streams on ESPN+ at 5 p.m.